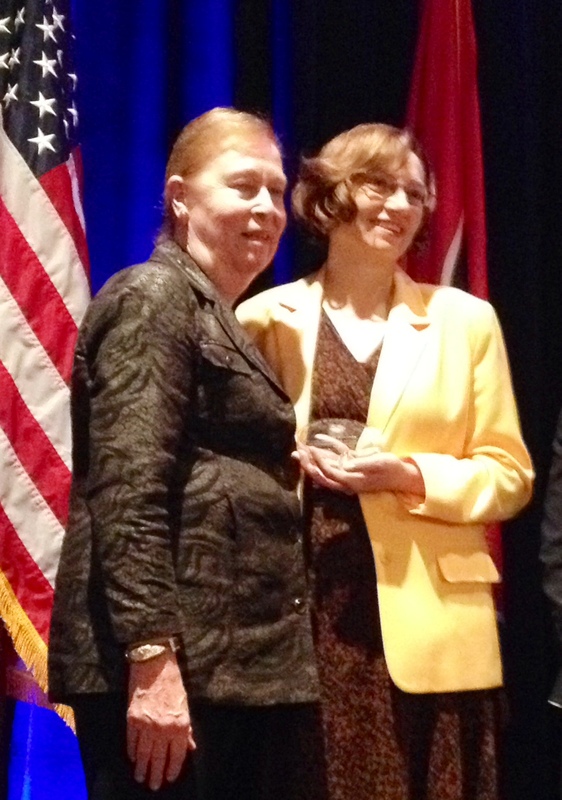 On Monday, October 28, 2013 Lorry Schoenly received the B. Jaye Anno Award of Excellence in Communication at the opening ceremony of the 30th annual National Conference on Correctional Health Care. This award honors innovative, well-executed communications that have had a positive impact on the field of correctional health care. Lorry is the first nurse to receive this prestigious award and she received a huge round of applause from the audience. The award is named after our beloved Jaye Anno, the co-founder of the National Commission on Correctional Health Care (NCCHC) and she attended the ceremony to present the award to Lorry. The award acknowledged Lorry’s use of “new” media to bring resources to health care providers working in correctional health care. These include the text, Essentials of Correctional Nursing and this accompanying blog post, also CorrectionalNurse.net, and podcasts on Correctional Nursing Today. Each of these media sources are dedicated to bringing practical, down to earth resources to nurses specializing in the field of correctional nursing. Lorry was also recognized as a frequent contributor of articles to various peer reviewed journals as well as the periodicals CorrectCare, CorrectionsOne.com, and Corrections Today. Further she has made her wit, inspiration and advice available on Twitter, Facebook and LinkedIn and can be counted on to respond practically 24/7 to professionals in the field. It was just a year ago when Lorry and I celebrated the publication of the Essentials of Correctional Nursing with our contributing authors, nurse experts and peer reviewers at the NCCHC Conference in Las Vegas. This year nearly all these nurses were in the audience applauding Lorry’s accomplishment. Take a moment to reflect on Lorry’s point, that when we are open to new ideas and experiences we can transform our present circumstances to accomplish the aspirations we have for the future. What do you dream of accomplishing in your future as a correctional nurse? Send Lorry congratulations for her vision and perseverance in the pursuit of transformative ideas that is honored by this award by replying to this post or directly at http://www.facebook.com/lorryschoenly . By the way, all the copies of the Essentials of Correctional Nursing in the bookstore at NCCHC sold out by noon on Sunday, eighteen hours before the opening ceremony when Lorry received the B. Jaye Anno Award of Excellence in Communication. However copies can still be ordered directly from the publisher and if you use Promo Code AF1209 the price is discounted by $15 off and shipping is free. This entry was posted in Awards and celebrations and tagged correctional nursing, Essentials of Correctional Nursing, jail nurse, Lorry Schoenly, National Commission on Correctional Health Care. Bookmark the permalink.